The battered bulls sprung from the mat this morning, dukes up and fighting mad. All three major averages rallied hard in early trading. But late morning the bears landed another clout… and the bulls were back on the canvas, taking the count. The Dow Jones ended the day down another 220 points. The S&P lost 30; the Nasdaq, 195. The bank tracks some 70 asset classes. These include global stocks, bonds, commodities, currencies, real estate — everything, A through Z. 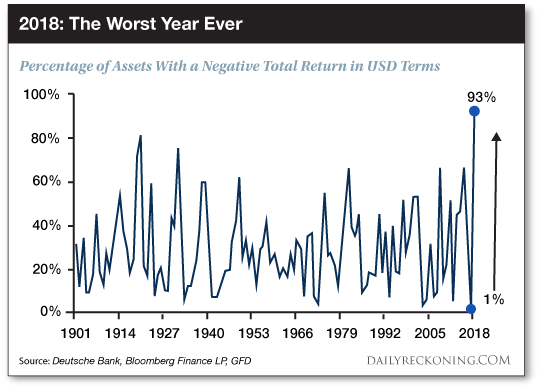 And 93% of these assets are negative on the year… eclipsing the 84% mark set in 1920. Only 1% of these asset classes yielded negative returns last year — 1%. Might central banks somehow account for the Jekyll and Hyde act? Do not forget, the Federal Reserve commenced quantitative tightening (QT) last October. Foreign central banks are likewise tightening the taps, though to a lesser extent. This is what happens when the vast majority of global assets are expensive historically due to extreme monetary policy… It’s perhaps not a surprise that in this time major… central banks have moved from peak global QE to widespread QT. As a Daily Reckoning reader, you are likely chockablock with knowledge of quantitative tightening. But let us now direct your attention toward monetary analysis of which few are aware. That is, let us consider the “true money supply,” or TMS. Economists of the “Austrian School” crafted the metric in the 1970s and ’80s. Existing measures of money supply gave false readings, they claimed. 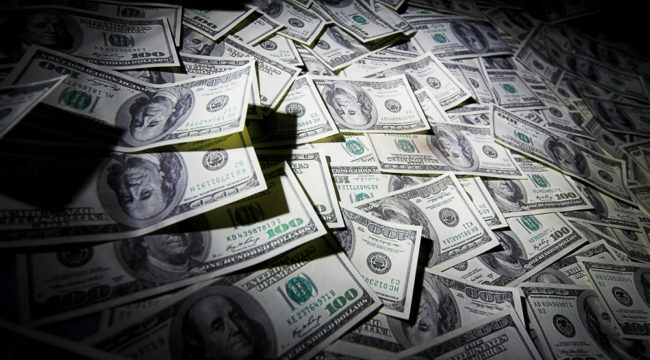 The true money supply consists of cash, demand deposits (i.e., checking accounts) at banks, savings… and government deposits at the Federal Reserve. That is, it consists of money immediately available for transaction. It excludes money market funds, for example. We take the figures published by the Federal Reserve and remove some items that shouldn’t be there and add some items that should. For instance… they include money market funds. (A money market fund is an investment in income-paying securities. It’s not really money in the sense that money sitting in your checking account is.) What we’re doing is removing all the transactions of lending and credit, and we only add those items that are pure money, which are claim transactions, like demand deposits. This TMS business is complicated… and we refer you to Professor Google if its inner wizardry interests you. If the TMS is a reliable weather vane of monetary conditions… the breeze is dying. It appears that moment has come. Note the red arrow to the right. Does it not align with the arrow on the left… that preceded the 2008 financial crisis? Economist Joseph Salerno helped develop the TMS. What is of great interest is that the recent deceleration of monetary growth (the second red arrow) almost exactly matches in extent and rapidity the monetary deceleration (the first red arrow) that immediately preceded the financial crisis of 2007–08. But perhaps Salerno chases a shadow, a phantom, a chance correlation trussed up as evidence. The qualitative relationship between TMS growth, credit crisis and recession has been remarkably clear since 1978. 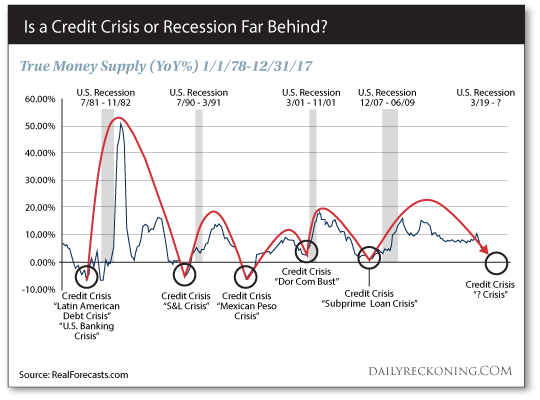 Recession or credit crisis followed previous occasions when the true money supply decelerated at the present clip. Not to the month, day or hour, of course. But economies run to a lagging schedule. Does the foregoing mean recession — or credit crisis — will soon be upon us? The top-right line in the chart suggests a recession starting in March. We take any economic forecast with truckloads of table salt — as should you. 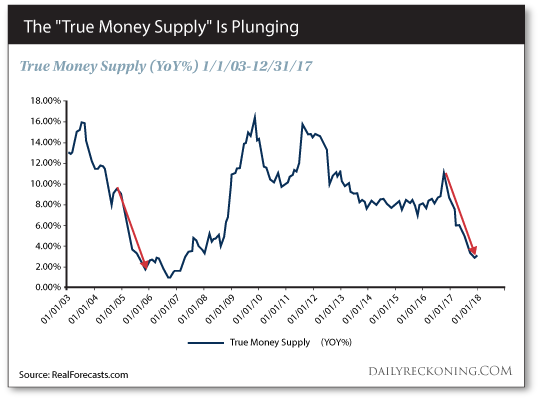 But given its record, this true money supply rates a serious consideration. This Wednesday Jerome Powell said quantitative tightening will proceed apace — on “autopilot” no less. And the economy is speeding for a brick wall. Meantime, a government shutdown is looming for midnight tonight in the absence of a budget deal. Trump has threatened “a shutdown that will last for a very long time” if denied funding for the border wall.